The biggest Korean national feast, Chuseok, is the day when the immigrant women of multicultural families who have left their homes feel more homesick. 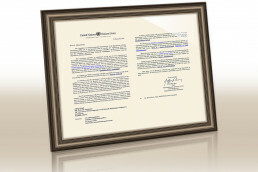 In order to inform Korean culture and deliver a mother’s love to them who have difficulties with the language gap and cultural differences, the Intl. WeLoveU Foundation threw a Korean culture experience event a few days before Chuseok Feast at Busan Indonesia Center at 11 A.M. on September 9. 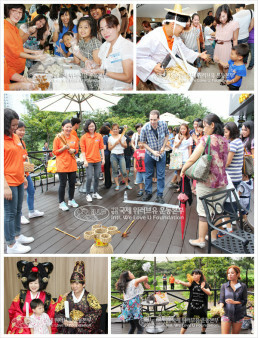 This event was conducted by Busan Branch of the Intl. 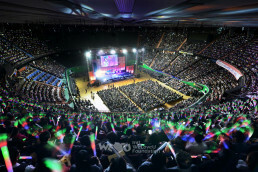 WeLoveU Foundation, and supported by Indonesia Consulate in Korea. About 250 multicultural family members from Indonesia, Philippine, Vietnam and China and about 100 volunteer members from the Foundation participated in this event. Chairperson Kim Yeong-do from Busan Branch of Intl. 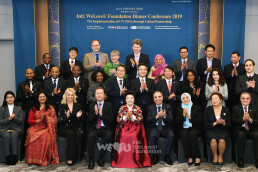 WeLoveU Foundation, Honorary Consul of Indonesia in Korea Kim Su-il (Professor of Busan University of Foreign Studies), Chairperson Han Sang-mok from Busan Buk-gu Support Center for Multicultural Families, and local councilors joined together. After the opening ceremony, about 20 members of the Foundation showed classical music, popular music and chamber music performances. Just like multicultural families mingled with different cultures, harmonious melody made by various musical instruments brought an acclamation and applaud from the audience. 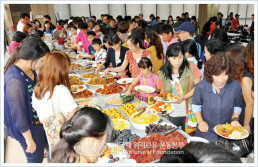 At the luncheon, multicultural families tasted Korean friendliness thanks to the feast food that the members had prepared wholeheartedly. In the afternoon, they tried on Hanbok [Korean traditional costume], and experienced making Songpyeon [stuffed rice cake]. Playing various traditional games like Jae-ki-cha-gi [Korean shuttlecock], neolttwigi [Korean jumping game similar to see-sawing], tuho [Korean traditional arrow-throwing game], etc., at the outside of the building, they also had a time to understand Korean culture. Finishing the event, the Intl. 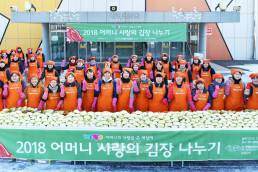 WeLoveU Foundation said that it would make a constant effort to reduce the prejudice and the sense of difference toward the multicultural families, and to help them feel Korea as their second home country. The multicultural families returned home with smiles on their faces. 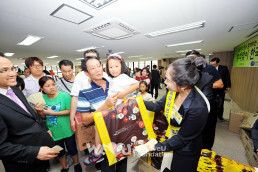 They experienced Korean friendliness and received heart-warming presents in addition to the gift pack in their hands.